It’s getting dark earlier and the weather is cooling down at night. What does that mean? Good TV and comfort food! 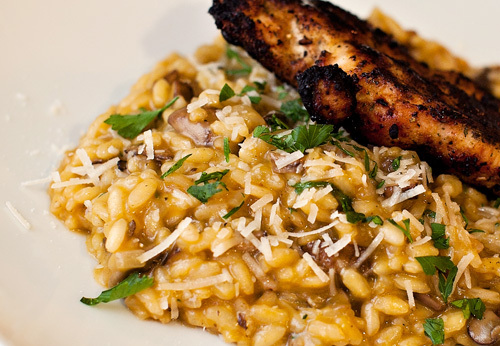 Last night we made Mushroom Risotto and it seriously hit the spot. Sautee mushrooms with 1 tbs olive oil and pepper. Set aside. Start heating your stock in a small sauce pan. In the same pan sweat the shallots with more olive oil, salt, and pepper over medium heat for about 5 minutes or until translucent. 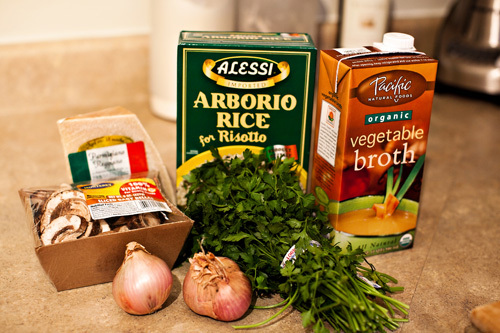 With your pan still on medium, add your arborio rice with a tiny bit more oil if necessary. Keep stirring until the rice starts to get translucent – around 2-3 minutes. Add hot stock 2 laddle fulls at a time. Keep stirring until it’s absorbed and then add more stock until it is gone. Cook for about 20 minutes until the rice is cooked and creamy. Just follow the directions on your box. Add your mushrooms and heat throughout. Remove from heat and add cheese. Top with a little more cheese and parsley. Enjoy!